C3G Events - Team Anti-Monitor Destroys the Universe!! Prepare for a new direction in C3G Promotions. On the heels of Secret Wars, C3G will be unveiling new interactive and story-based events beginning with "Crisis in the C3G Multiverse." Heroscapers will have the opportunity to participate and dictate the future of C3G's Heroscape Universe. These events represent a new promotional format that will hopefully provide additional excitement and interest to the already exciting C3G experience. By participating, you'll be a part of an overarching story...you'll build armies for story based scenarios, form allegiances, fight battles, and even win prizes. The great part of all this is that your experience is both influenced by others and personally customized to suit your C3G collection or other preferences (i.e. building custom maps). The idea being that everyone can participate; play online, play at home with a friend, organize a group to play at a local venue, or play in your basement against yourself . What will be the fate of the universe? Together, it's "Our Universe, Your Experience." At the beginning of each event Heroscapers will choose a side (e.g. Avengers, Justice League, etc.). Options will vary from event to event. To do this, you will need to register your username for the Event. This can be done by making a post in the corresponding Event thread stating what side you'd like to join. As a participating Heroscaper you will then be able to participate in key scenario battles as part of the Events program. Your battles will help you and your team win prizes while simultaneously influencing the continuation of the story of the C3G universe as it transitions to the next event. For example, depending on the established stakes for an event, when you complete a battle report it may score a point for your team; providing additional materials may acquire additional points. These points will help you and your team win potential prizes. Meanwhile, the combined results of your completed scenarios will contribute to the conclusion of the scenario's story. Events will be made up of scenarios, which may include multi-chaptered acts or smaller one-shots. In between events and/or acts there will be plot points, which will be open to the entire public. During plot points, depending upon the dictated stakes (e.g. polls, allegiances, or other actions) certain conditions, characters, glyphs, or other unlockables may be made available to specific armies or figures for upcoming scenarios. You may register for an event at any time during the event. So if you missed out on Act I, you can register for Acts II and III. Your participation will help your chosen side win the event, however, in order to qualify for prizes a registrant must participate in at least one battle scenario. "The Summoning" – A wall of pure anti-matter has destroyed the homeworlds of Invincible, Judge Dredd, Spawn, and Buffy. However, each of the heroes survived thanks to Beyonder, who has summoned them to Battleworld. The Beyonder explained to the heroes that they have been summoned to a parallel universe and that they must travel to multiple worlds spread across the time and space of the only two remaining universes or all will be lost. When the heroes inquired about what caused all the destruction, Beyonder explained to the heroes that a god by the name of Loki had found a device known as the Time-Space Key. By using the device he awakened a being known as Anti-Monitor. Anti-Monitor unleashed wave upon wave of anti-matter and destroyed every universe in its path. The waves mysteriously stopped - only a couple universes remain. Anti-Monitor now seeks the Time-Space Key as well as vengeance upon Beyonder and a group known as the Legion of Superheroes (*See Secret Wars Event). In order to save all of existence, the summoned are to travel to these last two universes and recruit a team of heroes from across the time and space of each universe. However, before their departure, they suffer a preemptive strike from Anti-Monitor’s forces. * Beyonder was responsible for the summoning of heroes and villains that started the Secret Wars. During that event, Anti-Monitor was defeated by the Legionnaires. Draft Point Limit: 930 or TBD by players. If an agreement can’t be made, use the 930 point limit.You may draft multiple common and uncommon figures. Player 1: As a representative of team Marvel or DC, P1 must draft from the following (at least 2 unique heroes must be drafted): Buffy Summers 210, Invincible 360, Judge Dredd 240, Spawn 320, Predator 240, Satanus 350, Werewolf 130. Player 2: As a representative of team Anti-Monitor, P2 must draft from the following: Thunderers of Qward 130, Shadow Demons 130, Parademon Shock Troopers 80, Sinestro Corps Soldier 110. PvP Restrictions: All PvP battles for this scenario must be a Marvel or DC representative vs an Anti-Monitor representative (i.e. No battles between Marvel and DC players). Setup: Player 1 must place each figure in their army on any available space in the middle of the map. Player 2 must place each of the figures in their army on the outside edge of the map. The Beyonder: At the beginning of the battle, Player 1 may place Beyonder on any space that is within 6 spaces of all of Player 1’s starting figures. At the end of each round, Player 1 may use Beyonder’s Supreme Summoning special power (ignore the “before moving and after attacking” restriction). If Beyonder has not been destroyed, Beyonder’s Never Ending Battle special power is always in effect. Note: Beyonder does not actively participate in the battle - no Order Markers are placed on his card. However, he may be attacked and destroyed. If destroyed, Player 1 may no longer use the Supreme Summoning special power or the Never Ending Battle special power. Anti-Monitor: The Anti-Monitor is not present for this battle. However, once per round Player 2, after moving and instead of attacking with a friendly figure, may use the Erase From Existence special power; anytime Erase from Existence refers to Anti-Monitor, it now refers to this figure. The Master of Time special power is always in effect. Note: Player 2 begins the game with initiative for the first round. Rounds: No round restrictions apply. Map/Setting Suggestions: This is Battleworld, create any map you like. If you want some guidance, choose one of C3G’s competitive or casual maps. Objectives: Destroy all opposing figures. Player 2 does not have to destroy Beyonder to win this scenario. Event Battle Report for this scenario is due by (November 9, 2013). Invincible (thought bubble): My home has been destroyed … no, my entire #$##$# universe has been destroyed. And now I’m part of a special task force to save all of existence, led by a guy that calls himself Beyonder…talk about a power trip…sigh, he’s probably reading my mind. A foggy haze has enveloped the planet’s surface. Evergreen trees poke out above the fog while Invincible skims over the surface, flying and weaving his way between tree tips, cloudy wisps swirling behind him. Invincible (thought bubble): Jeez, how long have I been out of it? Where is everyone? I need to find everyone ... Now. The Beyond Dude, Buffy, Dinosaurus 2, the Judge, a Hellspawn, and a couple armies worth of Hunters and Werewolves. How does one lose an army anyway, let alone two of them? Invincible stops and dips down into the fog below. He lifts up his uniform top, noticeable scars run across his abdomen and rib cage. Invincible looks down at the ground. Invincible (thought bubble): Hmph, this ground is very soft. Invincible jumps back, realizing that it is Satanus. Invincible (thought bubble): Is he dead? Aw man, I don’t remember this guy’s name. Invincible pokes his body and then opens up an eyelid. Invincible: Yeah, I think you’re dead. I guess that’s the end of Dinosaurus 2. A scream pierces through the air immediately drawing Invincible’s attention. Invincible flies off through the foggy air, again weaving, between trees, ruins, and piles of dead bodies. Invincible is shocked by the mass piles of death. The fog clears. The dead bodies of Thunderers, Parademons, Sinestro Corps Soldiers, Werewolves, and Predators, are strewn across the clearing. Buffy and Judge Dredd are being overwhelmed by Shadow Demons. A green glow lights up the clearing from the opposite treeline, Spawn emerges with guns ablazing, his Leetha guided chains tossing and eviscerating Thunderers. Decision, decisions. It's PLOT TWIST time..
A. ... Save Buffy Summers from the Shadow Demons. B. ... Save Judge Dredd from the Shadow Demons. C. ... Help Spawn fight the Thunderers. D. ... Take a rest and wait for Beyonder to arrive. In addition to those who are participating on one of the three Crisis teams, All members of the public are free to participate in this poll. Above the red glow of lava rock and magma, a yellow light streaks across the horizon. Inside the throne room, Darkseid rises from his Omega-shaped seat. The throne room’s large doors open; pushed open by a yellow construct. Sinestro enters the large room. At each side of the room, Magma chambers spit molten rock on the path leading to the throne. Sinestro pauses momentarily before proceeding toward the cross-armed Darkseid. When Sinestro reaches the stairs preceding the throne, he stops and waits for Darkseid’s response. Darkseid stares down the Yellow Lantern. An extensive silence ensues; Darkseid’s presence atop the stairs looms over Sinestro, but Sinestro holds his ground confidently. Sinestro: The Destroyer is displeased … Your Pardemons proved ineffective during the attack on Battleworld. Sinestro: He does not believe you are committed to the cause. He wants your sworn allegiance. Darkseid: I am not a pawn. I am a ruler. Darkness is everywhere. The smell of Death permeates the air. Thanos: What can you promise me? Loki: Knowledge. I’ve met destruction. He calls for you. Thanos: I have knowledge, I have the Infinity Well. Loki: Soon, that knowledge will be of no worth. In a world of puppets, the strings can be cut. Thanos: Fool, there is no limit to Infinity! Loki: Your desires for Death make you blind to the knowledge you seek. Thanos closes in on Loki. Thanos: Do not taunt me or I shall bring YOU death. Loki: (sarcastically) Oh, how I tremble in my boots at such an inevitable horror. Thanos: This is how you would treat your potential ally and Lord Almighty. Do you challenge me? Loki: In Odin’s name, no. I dare not tempt Death. Thanos: Enough of this grand drama. Answer the question. What can you promise me? What is your plan for that? Loki: Very well … I do have a plan for everything. Each team has a chance to influence the scenarios above and is now engaged in an online scavenger hunt. Each team must find an image of the comic book covers listed below and post it to this thread. However, team members may not post more than two cover images during a 24 hour period. First team to complete the scavenger hunt will be victorious. Scavenger hunt will continue until two teams have completed the hunt or Hellfire decides to invoke a time limit. Victorious teams will then unlock characters for use in future scenarios. Invincible: Looks like they need some help. Invincible speedily flies across the clearing toward Buffy Summers until a flash of bright light envelopes him. He’s now standing in front of the Lakeside Mall. Behind him, someone is weeping. He turns around and sees that it’s Samantha Eve. Samantha (Atom Eve): Mark? Mark! You’re alive!? … Buffy’s in his arms. He’s back on Battleworld. Buffy pushes him away. Buffy: Where’d you? … How’d you? … I could NEVER be your girl! Invincible is shocked, dazed, and confused. From behind, a Thunderer lunges at Invincible. Buffy fires an arrow that slips past the Thunderer’s shield, taking it down. Invincible remains in a motionless daze. Invincible: Eve? . . . .
Judge Dredd, Satanus, and all the Predators and Werewolves have been killed. Beyonder approaches the remaining battle ridden heroes, piles of bodies surrounding them. Beyonder: You must go. Time is against us. Buffy: Where are you taking us now? Beyonder: I’m not going anywhere but you are going to lead a counterattack and you will be joining forces with members of the home universes. Only together will we be able to stop Anti-Monitor. Anti-Monitor’s preemptive strike on Battleworld was just one of the many attacks throughout the universes. In the midst of the heroes’ counter-offensive, waves of anti-matter ripple through time creating an incalculable amount of “time glitches” throughout the time and space of the Marvel and DC universes. In this scenario there are two battles: Jotunheim and Apokolips. Players are allowed to play out both battles, in fact, players are encouraged to play out both battles. Players receive points for each battle; subsequently, there are twice as many points at stake here. Hope you enjoy. Temporal Displacement: At the beginning of the game you may place 4 (or more, at the discretion of the players) Glyphs of Temporal Displacement and up to two Glyphs of Superspeed on the map. Glyph of Time-Space Key: Loki and Cosmic Boy begin the game with the Object of Power Glyph. When this figure rolls attack, defense, or twenty-sided dice, you may re-roll all the dice once. This figure cannot be moved by the Glyph of Temporal Displacement. Neutral Units: Place the neutral unit on any unoccupied space that is an equal number of spaces away from the nearest figure of each army (roll the 20-sided die to choose which player places the neutral unit). Once per round, after revealing an Order Marker and taking a turn, you may take a turn with a neutral unit. Neutral Units are considered an opposing figure to both armies. If a player's army is destroyed and a neutral unit is still on the board, the player of the destroyed army may immediately take control of all neutral units. Marvel vs Anti-Monitor = Jotunheim; Use whatever map you can, you can also make or design whatever you think is appropriate. DC vs Anti-Monitor = Apokolips; Use whatever map you can, you can also make or design whatever you think is appropriate; a lot of magma/lava terrain seems appropriate . Objectives: Destroy all opposing figures. The third scenario is here! The Yellow Lanterns are retreating from Apokolips. Darkseid's location is unknown. Cosmic Boy stares ponderingly at the small golden trinket in his hand, the Time-Space Key. It's glowing. Guy Gardner: What are you doing? We need to stop Darkseid. Guy Gardner: What do you mean we can't? We're winning! Cosmic Boy: What do I mean? I mean he's gone. You have no battery left. We need to go. Guy Gardner: I don't need a ring to take Darkseid. Cosmic Boy: We don't have time for this. We've been fooled. The Convergence is already starting. Cosmic Boy grabs Guy by the arm, activates his ring, and disappears. When the two heroes reappear they are standing atop a high balcony. A flying car zips by. Cosmic Boy: Welcome to Legion Headquarters. It's time to get to work. He's coming. Not long thereafter, Guy Gardner stands with an army of Legionnaires. In the distance, swirls of yellow and blue envelope the sky above. Cosmic Boy: Legionnaires, this is it. A last stand. A battle for all time. The Anti-Monitor is here! A sound like thunder roars overhead before fading away. In front of the Legionnaires, hovers Superman. His face is stern and focused; he says nothing. He simply turns slowly toward the swirling clouds of blue and yellow before blasting off in a blur of red and blue. The Legionnaires quickly follow. "The Battle of Jotunheim pt. 2"
Loki and Thanos stand silhouetted at the front of a small ice cave. A silver streak surfs across the sky behind them, disappearing as quickly as it appeared. Thanos: Why have you lead me away from the battle? Loki: Don't be so presumptuous. I've only lead you to the battle. The coming battle. Thanos: Stop the riddles, you self-assuming King. Loki: So be it, deathless one. Here's your prize. Loki reveals a locked chest. In a slight of hand, he conjures up the Time-Space Key, brandishing it wildly before directing it towards the chest. With a click, the chest pops open. Thanos: How did you acquire this? Thanos turns back to Loki but Loki is gone. Briefly, Thanos wonders what Loki is up to. The thought is lost as he slides the Infinity Gauntlet over his hand--each gem glowing. Thanos: I will bring Death to me! Outside the cave, a thundering voice is heard. The ground shakes at his every word. Odin (the voice): SURTUR! Stop this madness. Temporal Displacement: At the beginning of the game, you may place 4 (or more, at the discretion of the players) Glyphs of Temporal Displacement and up to two Glyphs of Superspeed on the map. Glyph of Time-Space Key: Cosmic Boy and Loki begin the game with the Object of Power Glyph. When this figure rolls attack, defense, or twenty-sided dice, you may re-roll all the dice once. This figure cannot be moved by the Glyph of Temporal Displacement. Neutral Units: Place the neutral unit(s) on any unoccupied space that is an equal number of spaces away from the nearest figure of each army (roll the 20-sided die to choose which player places the neutral unit). Once per round, after revealing an Order Marker and taking a turn, you may take a turn with a neutral unit. Neutral Units are considered an opposing figure to both armies. If a player's army is destroyed and a neutral unit is still on the board, the player of the destroyed army may immediately take control of all neutral units. Battle of Jotunheim pt. 2: The first army to destroy Surtur wins the game. If it is a PvP battle, the player that destroys Surtur receives 1 bonus point for their event team and the player that gave Surtur the most wounds receives 1 bonus point. DC vs Anti-Monitor = Legion Headquarters; some castle terrain may be a good idea. Marvel vs Anti-Monitor = Jotunheim; make or design whatever you think is appropriate (lots of snow and ice ). DC vs Anti-Monitor = Destroy all opposing figures. Marvel vs Anti-Monitor = The first army to destroy Surtur wins the game. Well Scapers, C3G's second event is coming to a close soon. However, two scenarios remain. We also have our final plot point. Currently, Team Marvel holds a slim lead. Good luck and enjoy. The mists of battle rise. Legion HQ rests in ruins. The bodies of Legionnaires are strewn across the ruins and battlefield. A body stirs. Invincible lifts himself up. He is sluggish. Invincible stands and look across the wastes of the super war. Superman and Guy Gardner rest amongst the dead. is surrounded by nothing but an infinity of white. Invincible: Right, the Beyondman... You know, your plan isn't working so well. Alright Scapers, Beyonder is going to summon the heroes for one more battle for all time. Where will he summon them? All Scapers are encouraged to vote. Don't hold back. Let us know where you think the final showdown with the Anti-Monitor should occur. "Earth Invasion Skirmishes - Gotham City Streets"
The Bat Symbol emblazons the darkened sky. Civilians scream and run from Shadow Demons. In a nearby alley, a Thunderer is about to smash his shield into an innocent woman. A whip cracks and the Thunderer is pulled back. In the streets, Cops and SWAT attempt to seal off the area and hold off the invaders that are appearing out of nowhere. At the front is Commissioner Gordon. Commissioner Gordon: We're going to need backup. From out of the darkness, three figures engage the enemy...Batman, Robin, and Nightwing. "Earth Invasion Skirmishes - Helicarrier"
In the Helicarrier bridge, Captain America and Nick Fury argue over political concerns. A loud crash is heard. Fury directs his attention to the communication panel. Dum Dum Dugan (over the radio): Director Fury, we're under attack. Nick Fury: Tell me something I don't already know. Fury turns back to Captain America, but the Captain is already gone. Marvel vs Anti-Monitor = 520 (or, as always, choose a total both players agree upon). Event Battle Report for this scenario is due by (February 22, 2014). Last edited by Hellfire; April 12th, 2014 at 10:34 PM. Re: C3G Events - Coming Soon! - Give a brief overview. .
Map: (Let us know what map you used; if a custom map was used, describe it) . Who won and with how many wounds? Also, list each unit destroyed during the battle and which unit destroyed it. .
Post this report in the C3G Events thread. Thanks. Last edited by Hellfire; October 19th, 2013 at 11:07 PM. The Anti-Monitor, angered by his defeat on Battleworld at the hands of the Legion of Superheroes, has vengefully unleashed the power of anti-matter upon a seemingly infinite number of worlds. Now, only a few universes remain, but his anger is not satiated. He seeks vengeance upon the Legion and even the Beyonder. A small handful of heroes escaped destruction and have been summoned to Battleworld. They count themselves among the survivors of Anti-Monitor's destruction and owe their lives to Beyonder. Now, the survival of the remaining multiverse primarily falls upon the shoulders of a small group of refugees that must travel through time and space to gather the heroes of the Marvel and DC universes. It's the beginning of a new battle of all time and it’s time to choose a side! In October, after the release of Super Secret Exclusive #26, C3G’s Crisis in the Multiverse will begin. Note: No team may have more than 2 participants more than any other team (e.g. If 4 participants sign-up for Marvel, there must at least be 3 participants signed-up for both DC and Anti-Monitor before a 5th participant may sign-up for Marvel.). When signing up just list your selected team in a post within this thread. - Participants choose a side. - A scenario is announced. - Participants sign-up for the scenario. - Participants submit battle report results. - Participants receive points based on their results. 2 points – Submit battle report + at least two in-game photos of battle in the report (photos must be shared in this thread and as a comment on C3G’s Facebook Crisis Event thread). Screenshots of online play will be accepted. Also, pictures of proxy figures will be accepted as well but be sure to let us know what figure the proxy represents. 3 points – Submit battle report + link the battle report to a Youtube video of your battle (this video must be comprehensive enough for a casual viewer to watch the video but also watch the full battle). Videos can be of any kind of battle; online, PvP, solo-play, etc. 4 points – Submit battle report + 2 photos + Youtube video. +2 points – Participate and win a PvP battle (The opposing player must be from another team and must be a plausible opponent as dictated by the scenario. Also, Battle Reports will be required of both/all participants). - Battle report results will be weighted and will guide/dictate the event’s plot, thereby impacting future scenarios. - Plot Twists (open to the public) will open up public votes and games that will unlock conditions, glyphs, and/or characters. Also, these results may dictate the actions of a specific character or group of characters during the event. Plot Twists may also allow teams to score bonus points. - After a plot twist, a new scenario will be announced. Play will continue until the event is concluded. - The team and player with the most points at the end of the event will be declared as the Victors of the event. - Each victor will receive a prize as to be determined. This is new for everyone. If there are any questions, don't hesitate to ask. But start signing up and let's get ready for October's Crisis in the C3G Multiverse! It’s been fun. But this is the last scenario. Everyone has one last chance to score some additional points for their team and influence the beginning and end of the C3G Universe. We hope each of you have enjoyed it. We have learned a lot from this and hope to make future events even better (in fact, there will be a survey being released at the end so participants can tell us about their experience). Tornado and I look forward to seeing these events grow and become ever more exciting. Until then, good luck and happy scaping! The people of all Earth’s and worlds look up to the sky and shout “Save us!”. The Anti-Monitor has arrived. The end has come. Each player may only do one battle each, representing the army/side they signed up for at the beginning of the event. The DC and Marvel player must have Invincible and/or Spawn in their army. The Anti-Monitor player must draft Anti-Monitor. DC +1XP and Marvel +1XP: Invincible (360), Spawn (320). 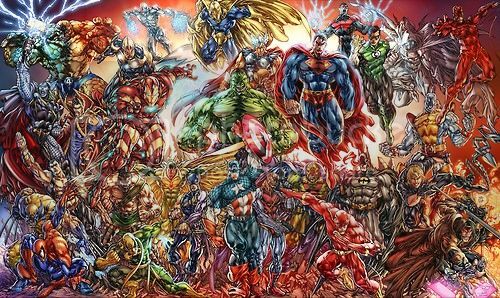 The DC player may draft any figure that is from the DC universe that is not on the Anti-Monitor or Neutral Unit draft list. Likewise, the Marvel player may draft any figure that is from the Marvel Universe that is not on the Anti-Monitor or Neutral Unit draft list. Anti-Monitor +2XP: Anti-Monitor (1600), Shadow Demon (130), Thunderers of Qward (140), Loki (420), Enchantress (380), Executioner (370), Cyborg Superman (380), Sinestro Corps Soldier (110), Darkseid (380), Parademon Shock Troopers (80). Glyph of Time-Space Key: Loki begins the game with the Object of Power Glyph. When this figure rolls attack, defense, or twenty-sided dice, you may re-roll all the dice once. This figure cannot be moved by the Glyph of Temporal Displacement. Neutral Units: After each player has placed units in their Starting Zone, place the neutral unit(s) on any unoccupied space that is an equal number of spaces away from the nearest figure of each army (roll the 20-sided die to choose which player places the neutral unit). Once per round, after revealing an Order Marker and taking a turn, you may take a turn with a neutral unit. Neutral Units are considered an opposing figure to both armies. If a player's army is destroyed and a neutral unit is still on the board, the player of the destroyed army may immediately take control of all neutral units. Thanos is Galactus' Herald for this scenario. Marvel/DC vs Anti-Monitor = Savage Land; use this map or create something similar. Marvel/DC vs Anti-Monitor = Destroy all opposing figures. Last edited by Hellfire; April 12th, 2014 at 10:28 PM. An open-ended C3G RPG? Fun! Yeah, similar at the least. The approach may (probably will) vary from event to event. But the overall structure presented above will remain the same. I suppose I could listen to this in the meantime. Never used the subscribe to thread button before but this is one I'm going to want to use it for. Last edited by marrowick; May 24th, 2013 at 12:20 PM. Sounds like a blast to me! Last edited by MegaSilver; May 24th, 2013 at 01:36 PM. Reason: Or the Avengers, or the Gorilla City Warriors... Muhahahaha!